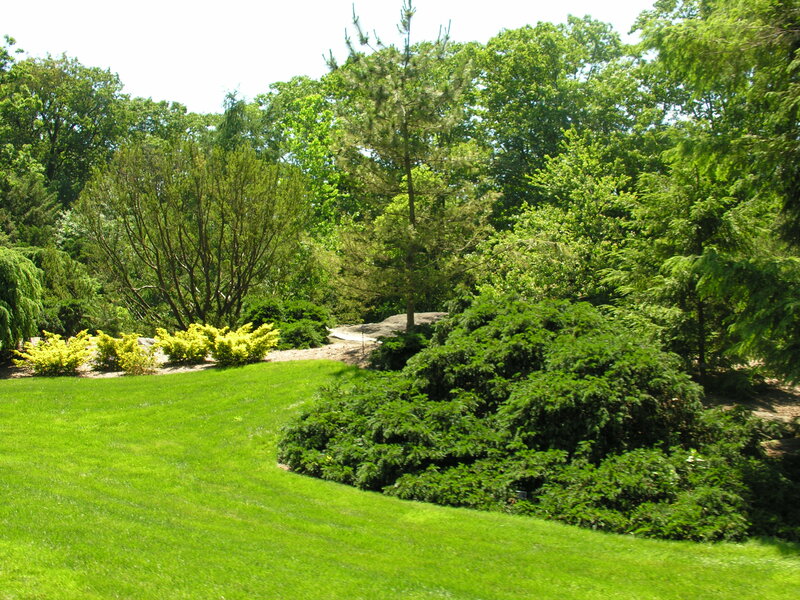 The New York Botanical Garden provides an oasis of relaxing green in an intensely urban setting. 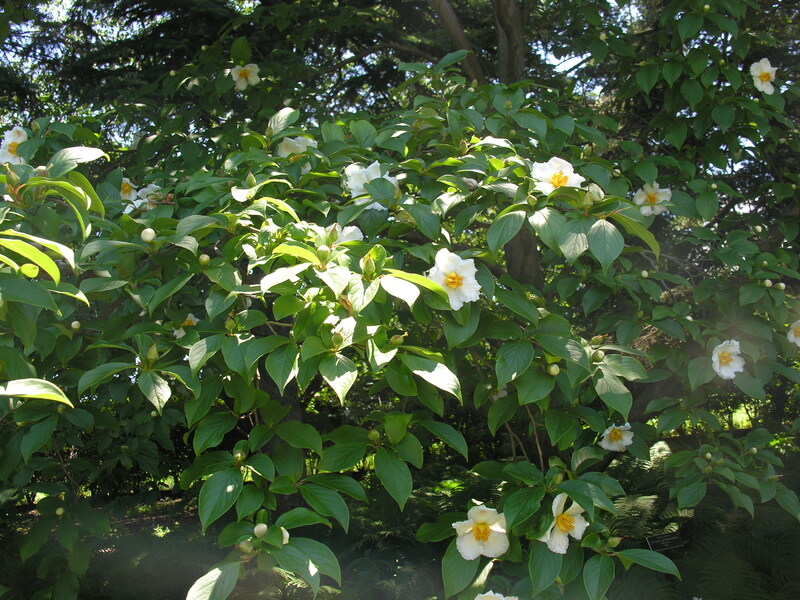 I have been nattering on about the ornamental plantings I saw – and they are beautiful – but the trees are spectacular. This is a world class arboretum. Here’s an example of the kinds of trees you will see here. There is also a “native forest,” a remnant of the old growth forest that is now Manhattan. We did not have time to walk in it, but I would like to visit it sometime. 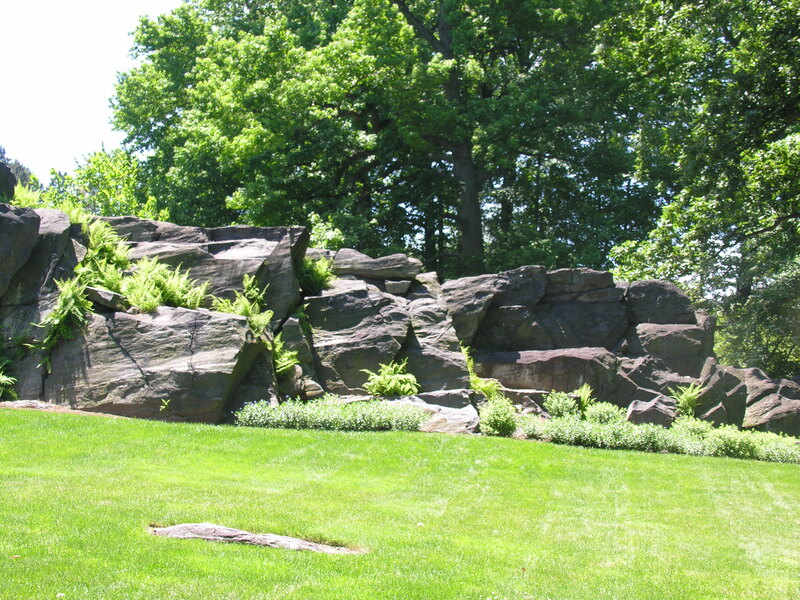 There are interesting rocky outcroppings in certain areas of the garden, and several small lakes. The Bronx River also runs through the property. 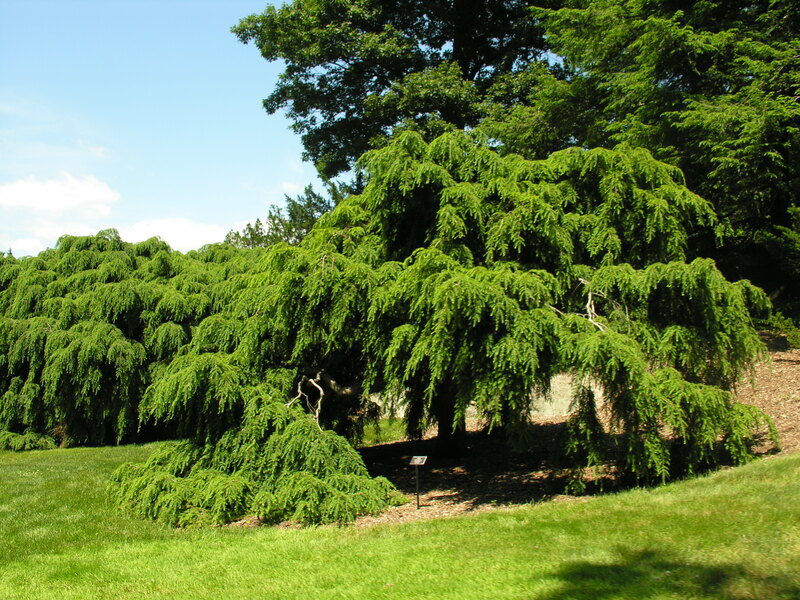 A weeping hemlock, one of my favorite trees. 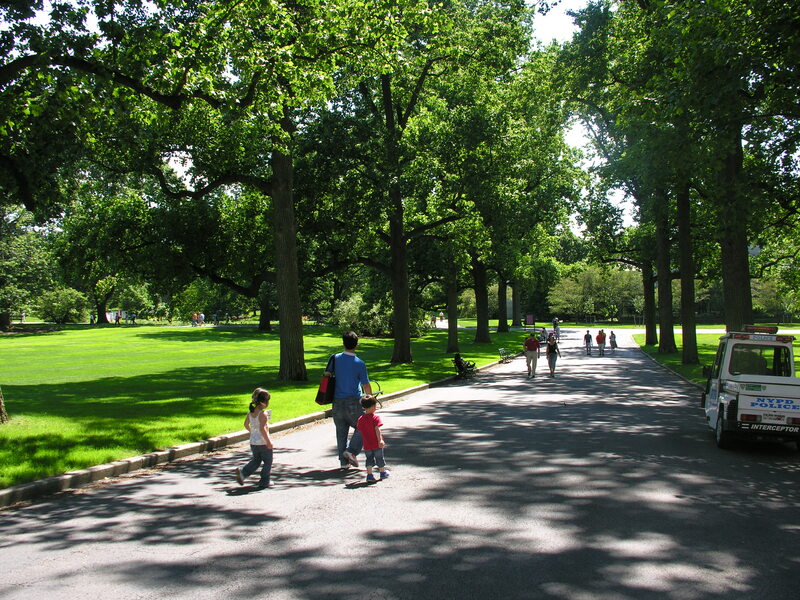 Families enjoying a stroll along the allee of tulip poplars. 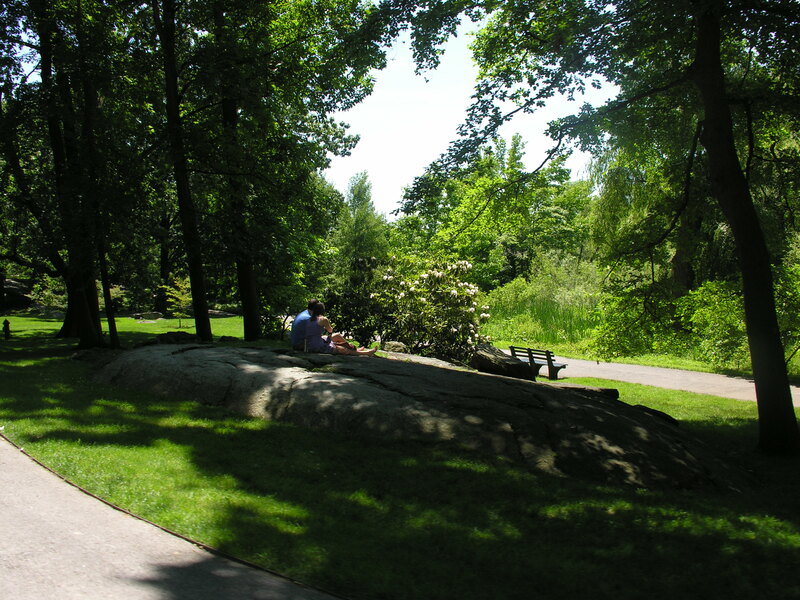 New Yorkers seem to love their botanical garden and treat it with respect. A few final things I really appreciated about this place: almost every plant collection was labelled, (thank you!!!) there was a tram, so you could jump on and quickly reach the next exhibit, and finally, there were large “you are here” maps everywhere which made finding your way around a breeze. 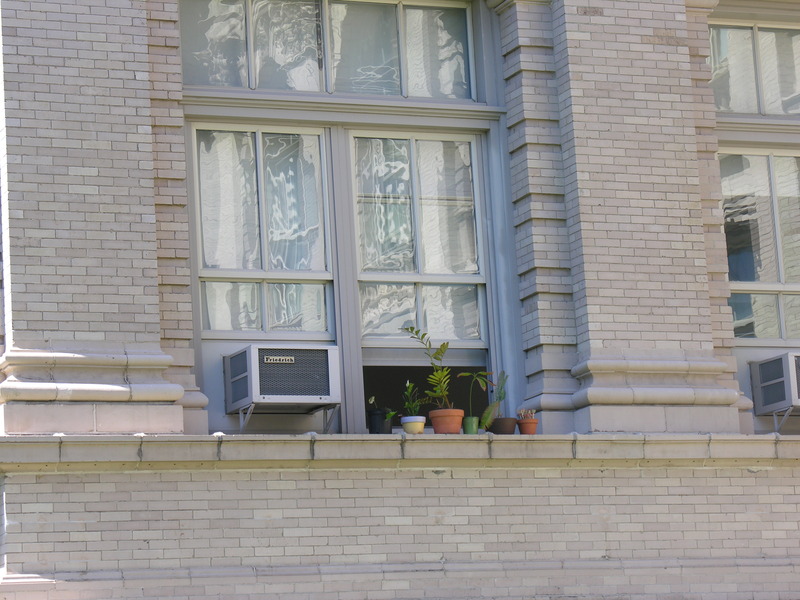 I will end with this shot I took of someone’s plants high on a window ledge of the Mertz library. Thanks so much for including trees in your posts, dn. I love them so. I’m seeking their comforting shade as I wander through my garden these summer days. There won’t be too much wandering, though. 107 here today. I’m keeping a sprinkler running almost all the time for the birds who are enjoying their shower baths in the heat.They’re constantly darting in and out. Fortunately, I have a well so there’s no cost. Wow! 107! It’s in the 90s here and very humid – much too hot for this girly from the Great White North. We have not a single tree on our property because people around here are always afraid they’ll come down in hurricanes. This means there’s nary a patch of shade to shelter in. My birds are loving our birdbath, too. Glad I can provide that. I learned a long time ago that a solitarty tree doesn’t stand much chance in very high winds. I had cleared an opening to build a house, and one night we had severe winds. The next morning I found that several hemlocks with trunks nearly 2′ in diameter had snapped. I realized that this was becaause I had taken away it’s buddies. So the wind came down into the clearing rather than going over the top. So I would propose planting a cluster of softwood trees, such as Cedars. They don’t grow too tall and I’m sure they would hold thier ground as a group. Not even little trees like dogwoods or mimosa’s or the likes? I, too, noticed those plants on the research library window sill. Made me smile to see plants “everwhere”. On that sweltering day the green of the woods there seemed such an intense color. And I enjoyed seeing the never before US-exhibited Monet paintings in their gallery. Thanks for a great reminder of that fun day. Oh but those crowds at times, I’m spoiled with our open space in this town. Ooops, before I forget – did you know that Juniper Hill Cemetery (National Historic Landmark) in Bristol has been nationally certified as an arboretum and Chris Fletcher is now Director. Chris has done a wonderful job as caretaker over the decades. That’s great about Chris. I took a tour of that cemetery once with him. Thanks for your interesting comments, GP. Funny you noticed those plants on the ledge, too.